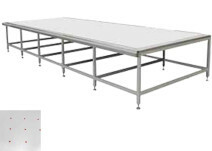 Spreading tables are designed and produced in order to facilitate the operation of material spreading. Kuris special tables are developed to state-of-the-art criteria. The water-resistant MDF-wooden plate offers good features against air humidity. Each table is equipped with stable profiles and an aluminium guide rail with integrated toothed belt. The connecting elements are screwable – based on modular design principle. Thus the tables can be prolonged. Each segment has holes for the electrical power supply / energy chain. Turning feet for the height adjustment with shock-mount mats allow an easy and equal table alignment. The KURIS air cushion tables are equipped with high-quality ring nozzles through which the air can stream out in an optimal angle. 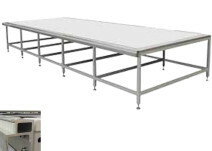 The airflow is distributed along the table in the best way. This prevents textile from wrinkling and helps to move it on the table plate in an efficient, gentle manner and without big efforts. The basis is our standard table. 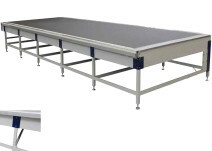 The KURIS conveyor belt tables are equipped with a PVC-belt, which fully automatically assists the spreading and cutting process. A manual operation is possible as well. By transportation of the materials on the belt, the production steps are optimized and the complete process is condensed. This table is also available with a link belt. Table plate material: MDF wooden plate, water-repellent.